At 1:31 and at 2:25 Mr Olson is seen with a model of Lamberson, I believe . . .
. . . and again at 3:36. Did Mr Olson visit the house, do you know ? It would be especially interesting to see models of buildings either no longer extant (Angster) or which were not built properly (Ennis). Mr. Olsen was supplied with drawings, of the Iowa houses, from the archives at Columbia to facilitate his current model building. 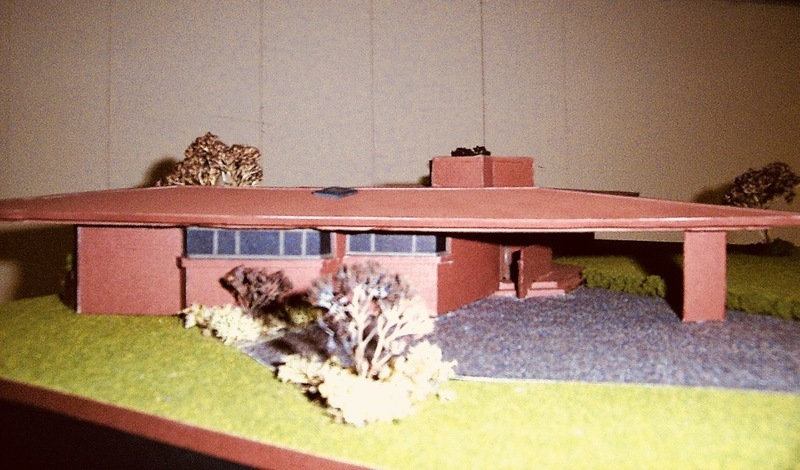 He is in the process of building models of all of the FLW Iowa houses, at our request, for display at our Architectural Interpretive Center in Mason City. No, he didn’t. It would have helped. There are a number of innacuracies. But I’m happy and grateful that he took it on.. When you say that the model contains inaccuracies, does that mean it's inaccurate to the house as built, to the drawings or to both? Actually, both. The problems are mainly with the model’s roof. 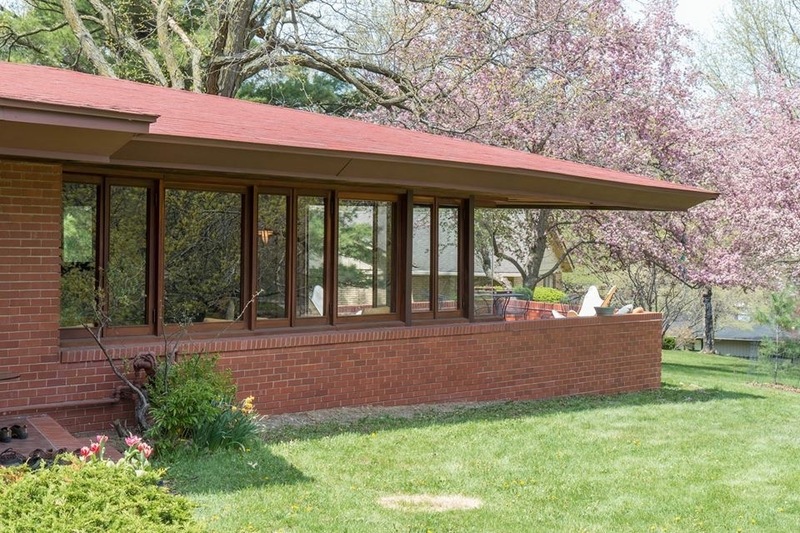 The actual Lamberson roof in Oskaloosa was built as Wright intended. Do any of you remember the magazine “Highlights” from your youth? There was always a page that had two slightly different drawings next to each other, and the object of the game was to locate the variations (mistakes) in one of the drawings. Other than the differences between the spacing of the living room window mullions/sashes and those on the model, my eye is immediately drawn to the model's chimney mass and carport roof which seem to have a different relationship with each other on the model vs. the house....and the carport skylight placement seems further removed from the masonry mass than it is on the house. More specifically, the model's chimney mass is not the vertical extension of the masonry walls below the fascia line as is seen on the house. This may be causing the model maker to "fill in the blanks" with roof shapes toward the back of the carport that aren't matching the as-built house. There may be other differences, but those are the ones that initially caught my eye. 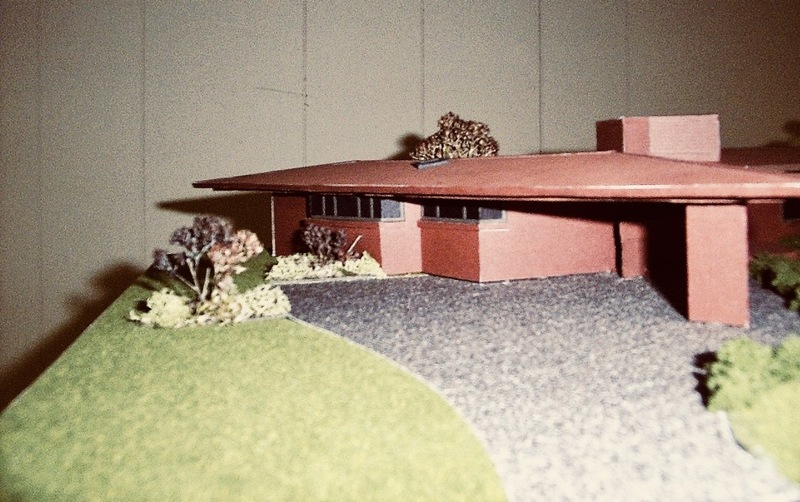 It should be noted however, if Mr. Olsen was working from a floor plan and published photos alone, he may not have been able to see and understand all of the facets of what is admittedly a complex roof form to model. I attempted to find a good aerial photo of the house on Google Earth but was disappointed . 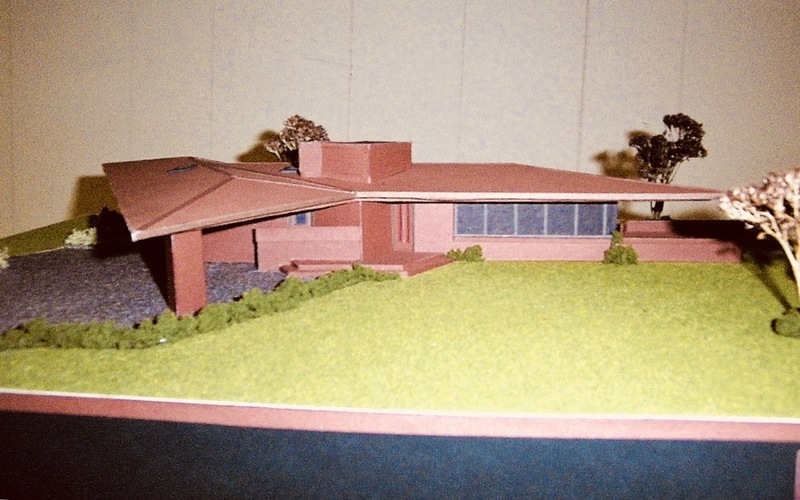 . .
As an avid model maker, I've always thought an FLW Museum should have models of all his designs. But there's an aesthetic component to any model. Back in the Wright's day, a model would attempt to reflect materials, colors, and even foliage. Sometimes this worked to good effect, but often it came across as a cheap model-train set. More recent models would "abstract" a lot of those elements, using one material like bass wood, and rendering any plantings in an abstract manner. The volume is what mattered. 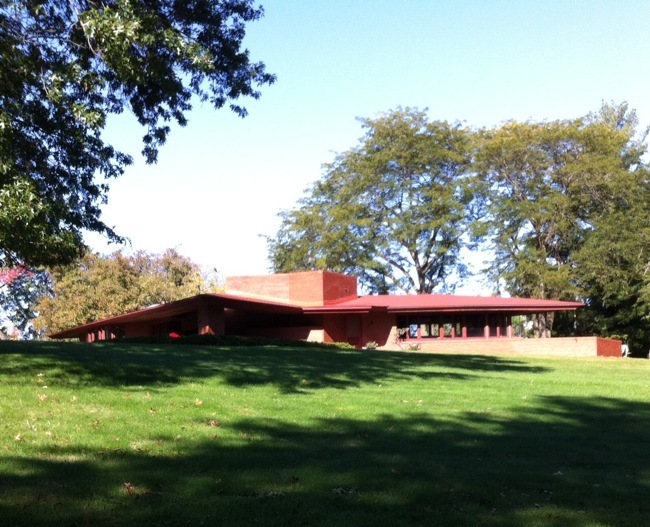 Of course, models at a huge scale, like MOMA's Fallingwater, can be very true to life. The Lamberson model pictured here seems to lack detail to my eye: no roof texture and no brick texture. I'd rather have that texture rendered in bass-wood than the color of the material. "drawings" of the object rendered at full scale -- though full-scale drawings of architectural details have always been a part of the designer's vocabulary. appealing to the layman, certainly, is a full-color rendering of the building. And, as Matt says, foliage is also subject to varying degrees of abstraction. determine what level of detail will be depicted, just as is the case with traditional two-dimensional architectural illustration. object to ignore or omit. However a model is scaled or finished, it is a valuable tool for explaining the structure, especially for those who don't know how to read architectural drawings. There is value in any of the approaches. The block houses have been modeled in the blank basswood style at significant scale to good effect by, I believe, USC students. 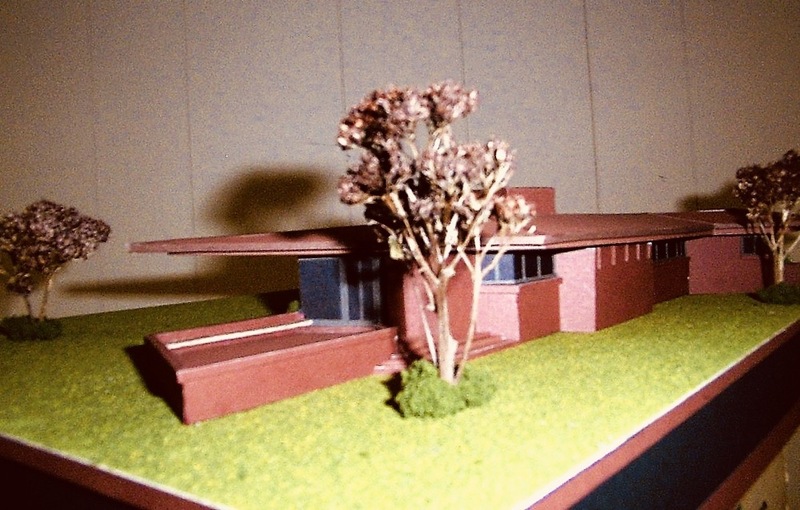 When MoMA held its FLW retrospective in 1994, there were full-scale (partial) models of Jacobs I (explaining its construction) and the San Marcos Project that were very effective. Also a monumental model of the Illinois Skyscraper rose up in the tall lobby of the museum. Colored models certainly help the laity, just as the perspectives by MMG help bring line drawings alive. In the '90s, an 1/8", uncolored balsa model of one of the Hollyhock couches helped raise funds for the reconstruction.